Rob and Grant talk about gestation periods and creepy TV kids. 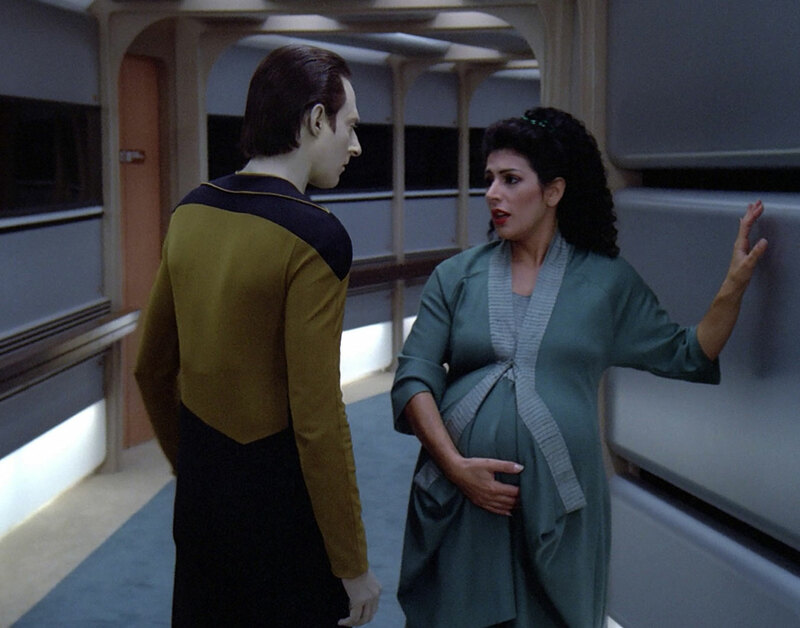 Counsellor Troi is shocked to find out she is pregnant; Wesley Crusher is weighing his options for the future, with the help of the proprietor of the ship’s lounge, Ten Forward, which suddenly appeared out of nowhere. Episode synopsis: 21st Nov 1988. Posted in Season 2, TNGTagged 1988, Children, Creepy, Family, Pulaski, Riker, TroiBookmark the permalink. Did anyone else notice the weird way Riker got up from the chair in Picard’s ready room at the start of the episode? He stood, spun and swung his leg over the back of the seat in a single movement. Very balletic. Great podcast again guys, though unfortunately the audio skipping problem seems to have returned. There’s a great illustration of Riker’s sitting technique on buzzfeed this week (search for “Here’s A Reminder That Riker From “Star Trek” Didn’t Know How To Sit In A F*cking Chair” as I can’t provide links without it passing moderation). This was the only time he got up in the same silly way, which made it all the more striking! Unfortunately, nooo the pesky audio issues are back. Are you making sure to listen through your recordings before you upload them? I’d also recommend doing a 10 minute test recording first, to ensure something isn’t going wrong in the recording process that causes these intermittent speed-ups and skipping.
. lol @ Colm Meaney’s huge head, it’s true, he’s a great actor but does have an oddly shaped head. Maybe that’s why he was cast as Don Revie in The Damned United, he also has an unusual head shape.
. Surprised no reference was made to the immaculate conception in this episode.
. Not sure this was mentioned due to the audio skipping, but Polaski and Data has clear parallels with Bones and Spock, in that Bones can’t really get around Spock’s ‘inhumanity’ too due to his lack of emotions.